This Celtic tiara features crystal set Trinity knots and shamrocks. Any Irish bride would be pleased to wear this Celtic knot and shamrock tiara that is enhanced with crystals. 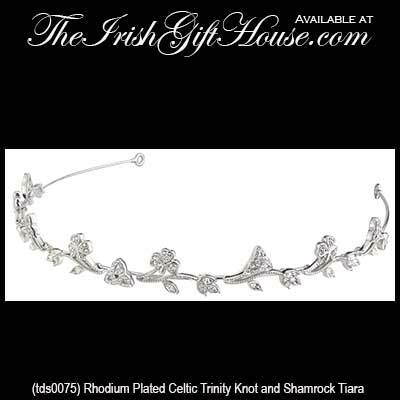 The Celtic tiara is rhodium plated and the Irish icons measure 3/8" x 3/8". 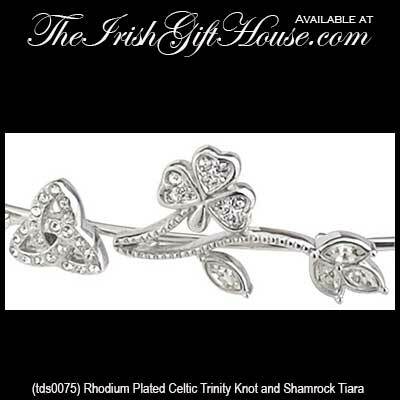 The Irish tiara is made in Ireland by Tara Jewelry and it is gift boxed with shamrock and Celtic knot history cards that are complements of The Irish Gift House.